I've turned to my Twitter friend, UK designer Sharon Bennett, before for inspiration... first, this gilded bird pendant and now her dot-dot-daisy. A quick glance at Sharon's stylish graphic was all I needed to get rolling... paper, that is! I think I'll use the card for an upcoming wedding, no wait, Mother's Day, no, a friend's birthday... it's one of those designs that has a ton of applications and is simple enough to make in an evening. Not to mention that a card with a top fold is a boon to lefties like me. I'm less likely to inadvertently press down on the quilling while writing a message inside. Plus, positioning this particular design with a top fold allows the flower to point downward as a natural branch would when it's loaded with heavy blossoms. 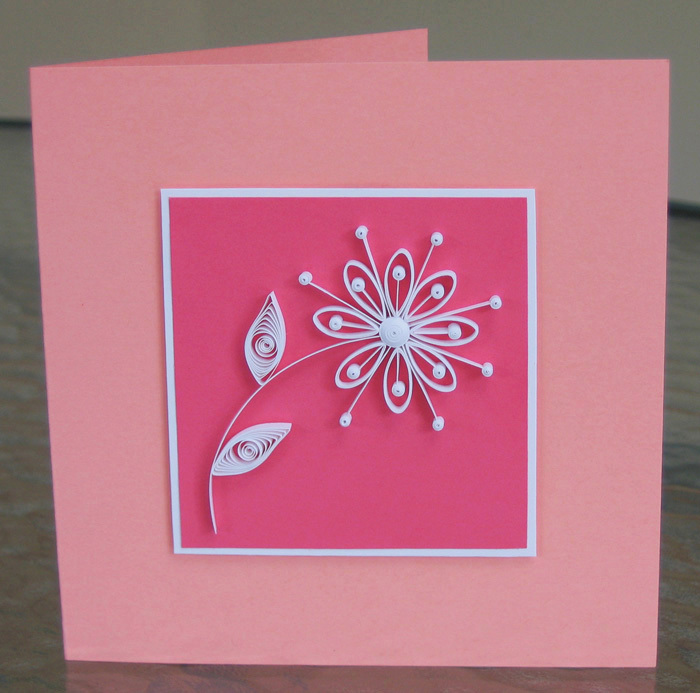 On the other hand, a card is a touch more traditional with the fold along the left side and the flower growing toward the sun... happily when a quilled design works in either direction, the choice is yours. By the way, it's the same card in both pics, honest. The first is the most realistic color-wise, but enough about that... let's get started! 1. The card measures 5.5 inches square and the hot pink interior square is a bit larger than 3 inches square. Cut a white square that is just a bit larger than the pink one. Adhere the pink square to the center of the white one with double-stick tape or a glue stick. 2. Glue two strips of quilling paper together lengthwise and set them aside to dry while making the other quilled components. This will be the stem and tiny straight bits. I use clear craft glue and if any gets on the outer edges of the strips, I run a damp cloth down both sides to wipe it away. 3. Make two 12 inch shaped marquises for the leaves. Make a marquise shape by rolling the strip on a quilling tool, allow the coil to relax, slip it off the tool, pinch two opposing points, glue and trim end. Hold each end of the marquise between thumbs and index fingers and shape it gently, one end up and one end down so it looks leaf-like. 4. Make a 7 inch domed tight coil as the flower center. Roll the strip on quilling tool. Glue the end in place before allowing the coil to relax. Slip coil off tool. Give the coil a domed top by pressing a fingertip against one flat side to curve it. Apply a thin coating of glue inside the dome to preserve the shape. 5. Make 8 ring coils by wrapping the paper around a 1/2 inch diameter cylinder 4 times. I used my quilling tool handle. Slip the coil off the tool and pinch one end to a point, creating a teardrop shape. Glue and trim end. 6. Make 2.5 inch tight coils (7) as the outer beads and 3 inch tight coils (8) as the inner beads. Same method as in Step 4. 7. Snip straight, double-thickness pieces - 3/4 inch (7) and 1/4 inch (8) - one for each tight coil. 8. Cut a 3 inch strip from the double-thickness strip and curve it slightly between thumb and index finger as the stem. 9. Use tweezers to assemble the flower on a nonstick surface, such as a sheet of acrylic. Remember that less glue is best for a neat result. When gluing the competed flower to the cardstock, I find it works well to spread a thin layer of glue on the acrylic. Touch the flower to the glue, then place it directly on the pink square. 10. Last of all, apply adhesive foam dimensional dots to the back of the white square and adhere it to the center of the peach card. 11. Send it or frame it! So elegant Ann! The tight coils look like beads. I wonder at how thin your needle must be. This is perfect Ann.. simple and beautiful.. love it..
Beautiful card, I love the flower, would you mind sharing the pattern? Thanks everyone! Paula, I haven't written a formal pattern, but the tight coil beads were 2.5 inch strips, the leaves were 12 inches, and I rolled each ring coil petal around the handle of my needle tool 4 times before slipping it off and pinching one end to a sharp point. Hope this helps. I LOVE this! I will be making some for sure...you're right, this card would be appropriate in lots of situations. Also, I didn't know you were a lefty-me too! Thank you so much Ann, will be giving them a try!!!! Very pretty! I like your color choices. Makes it really stand out! Hi Ann; I love both ways but I think I prefer the flower hanging down mostly. 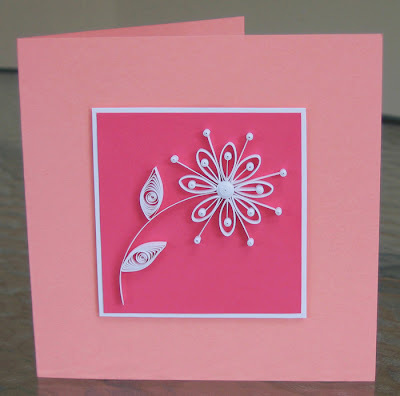 I really admire the all-white quilling though; looks fabulous on pinks too. This is beautiful. And I never thought about the top fold being handy for lefties. I might use that as my reason for making ALL my cards top-folded from now on. :) Thanks! So simple...yet so elegant and beautiful....love it Ann ! I love your card, this is so lovely and so perfect for a mom ! That's a great card, Ann, and the point about positioning is very well made - I had never thought of that! WOW! This is so elegant. At the first glance I thought you'd used pearls. Very neatly done. I love it! It's sort of Flora and Fauna meets the Jetsons! Thanks so much, everyone. The Bees Knees... ha! yes, that describes it to a T! Love this Ann! This kinda of reminds me of Mehndi art designs for henna which I've been toying with for design inspiration. I love the simplicity of this. It is lovely, Ann. Thank you Felicatt and Stephanie, I'm so glad you like it.